In this week's homes spotlight at TopTenRealEstateDeals.com, we feature the Top 10 Celebrity Homes that were for sale in 2016. Throughout 2016, many of the world's top superstars tried to sell their glamorous mansions and compounds. From Beverly Hills to Miami and New York City, there was a celebrity property on sale for almost anyone who is extremely wealthy. Hottie frontman for Maroon 5 and longtime judge on The Voice, Adam Levine and his supermodel wife, Behati Prinsloo, seem to be making their own lifestyle changes since welcoming their first child into the world in September, Dusty Rose. Prior to her birth, they put both their Beverly Hills mansion and their trendy New York SoHo loft up for sale. Selling soon after it was listed for $5.4 million to shoe designer Nick Lucio, Adam’s spacious New York loft makes a great bachelor or couples pad, but he converted the second and third bedrooms into open space in 2014, long before the baby news broke, leaving just its one large master suite. Located on a charming cobblestone street, the SoHo cast-iron building dates back to the early 1900s. At 2,800 square feet, the one-bedroom unit still retains its six original columns and exposed brick walls with arches embedded within the brickwork. With 13-foot ceilings and huge windows overlooking Greene Street, the open floor plan makes it feel larger than its square footage indicates with a 60-foot living room that opens to a kitchen with black granite and stainless high-end appliances. The large master suite bath includes jacuzzi, separate shower and large walk-in closet/dressing area. Adam hasn’t had as much luck with his Beverly Hills mansion, recently reducing the price from $17.5 million to $15.95 million. The listing agents for the New York loft were Adam Mahfouda and Jules Borbely of Oxford Property Group. Vacation homes are fairly common among the wealthy and even the not so wealthy, but when designer Pierre Cardin looked for a vacation home, he naturally chose one of the best locations in the world and a one-of-a-kind mansion with unique style. 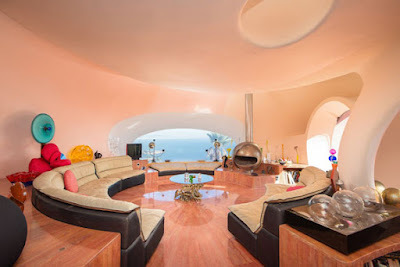 He chose a home on a Mediterranean cliff overlooking the sea made up of bubble gum pink bubbles. Mid-century architect Antti Lovag designed Le Palais Bulles - the Bubble Palace - in Cannes, France, which was built between 1975 and 1989. Pierre Cardin purchased the home at auction in the early 1990s as a vacation home. He was drawn to the property saying, “Round shapes have always inspired me,” and compared it to a woman’s body saying “. . . everything is absolutely sensual.” After all, Cardin did design the famous Bubble Dress in 1958 and is known for dressing The Beatles and the Rolling Stones. Currently for sale, the connecting bubbles representing one room each, is spread over six levels on 1.75 acres on a cliff with 180-degree-views over the Mediterranean. With not a straight line on the property, the 10-bedroom residence has all spherical formal and private rooms including curved bathroom fixtures. The lush gardens contain ponds and swimming pools that artistically reflect the architecture both during the day and when lit at night. At the edge of the cliff is a 500-seat, open-air auditorium with views of the Mediterranean and the Bay of Cannes. Michaël Zingraf Real Estate in Cannes, France holds the listing, recently reduced from $456 million to $335 million. It is the second-most expensive home currently for sale in Europe. After almost 20 years of Las Vegas appearances, Frank Sinatra wanted a place where he and his friends could hang out for an occasional hiatus from their fans in a private location. Sinatra referred to himself as an “18-karat manic depressive” which was carefully hidden from the public. He was always torn between wanting a solitary place to escape but also somewhere to party with his friends and distract from the depression days. In 1953, Sinatra had co-starred in the film “From Here to Eternity” cast as Private Angelo Maggio and won an Oscar for Best Supporting Actor. 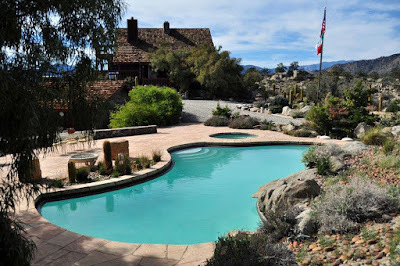 In 1967, Sinatra built a home on five acres 4,300 feet above Palm Springs and the Coachella Valley. He named it “Villa Maggio” after his character in the film. Now for sale, the home is the quiet, private retreat that Sinatra had always wanted. At Villa Maggio, he created the best of both worlds, perfect for entertaining his Rat Pack buddies to soften the lows or keep it to himself when experiencing the highs. The arrangement worked so well that he resided at the rustic estate for 12 years - almost until his death. The 10-acre compound of three buildings is perched on a craggy hilltop surrounded by boulders and exquisite views. Built in rustic style with warm woods, local stone and seven stone fireplaces in the main house, it has two kitchens, dining and living rooms, a den, five bedrooms and six bathrooms. The attached guest quarters have two bedrooms, bath, living room with fireplace and a full kitchen. The detached guest house is two stories with a small kitchen, a bathroom, a stone fireplace and a deck overlooking the view. It also has its own generator, water tower and well. The pool house has a great room with stone fireplace, two bathrooms, two saunas and a mini-kitchen with views over the pool and tennis court. A private helipad allows guests to fly in and out and there is parking for 25 cars. Although much of the home has been updated such as the commercial-grade kitchen, some of Sinatra’s personal touches are still at the home including a secret doorway, bathroom wallpaper and a Ronson foodmatic. The current owner’s family were Sinatra friends and the only occupants since he lived in the home. Markus Canter and Cristie St. James of Berkshire Hathaway HomeServices and Scott Palermo and Jim Sanak of Harcourts Desert Homes are the listing agents. Currently on the market priced at $3.9 million. The days of Elvis slouched on a well-worn overstuffed sofa with a plate stacked high with peanut butter and banana sandwiches on his lap are long over for the house that he and Priscilla bought for $400,000 when they were first married in 1967. Back in the day, the gated French Regency house had the great bones that it has today, but 1960’s Elvis style was a far cry from the slick, sophisticated home it is today. Along with the home of 5,400 square feet, the property has an attached guest house, large motor court and decadent pool terrace overlooking the city to ocean views. The four-bedroom, five-bath residence is sited on 1.18 acres on a street popularly known as “Billionaires Row,” which is quite the celebrity magnet. The newly renovated interior includes high ceilings, hardwood floors and floor-to-ceiling windows and glass doors that open to the terraces and view. Updates include new flooring, an added laundry room, upgraded electrical, stainless-steel kitchen appliances and resurfaced pool and spa. Oozing both glamour and warmth, the home has a luxurious master suite, skylights and fireplaces including one pool side with fetching venues for entertaining throughout the property. 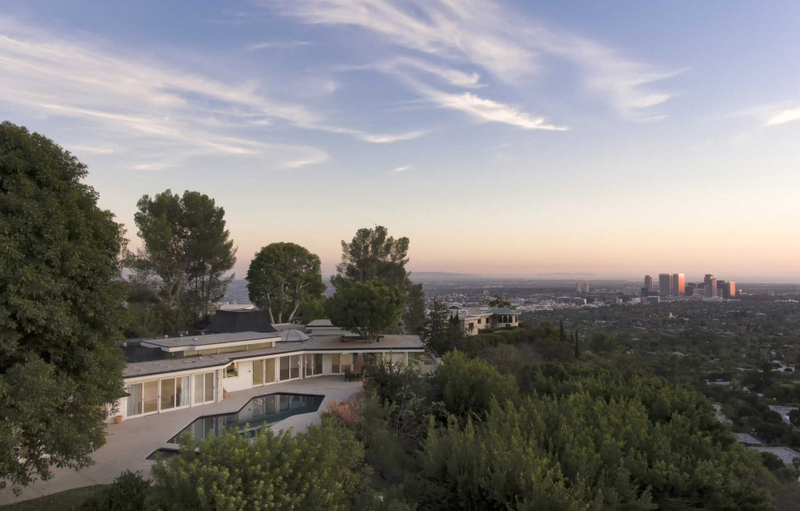 Mauricio Umansky of The Agency in Beverly Hills holds the listing for this newly updated contemporary estate formerly owned by The King of Rock n’ Roll. Priced at $30 million. When we sit gazing out our sliding glass doors over the yard or put our bare feet on the warm floor kept toasty by the under floor heating, we have Frank Lloyd Wright to thank for that. Short of upgraded appliances and fad changes in surface materials, the architectural concepts we enjoy most in our homes today came from Mr. Wright. The most famous architect in American history, Frank Lloyd Wright designed over 1,000 structures (532 were completed) in his 70-years-plus career - mostly homes but also hotels, schools, churches, the Johnson Wax Headquarters and the Guggenheim Museum. His final design was the Norman Lykes House in Phoenix in the same year of his death in 1959. It is now for sale priced at $3.25 million. With a site on top of Palm Canyon with views of the valley, Wright began the Lykes design by replicating the curves of the mountainsides, making the home an integral part of its environment and providing big views for its owners and visitors. Though Wright passed away before finishing the working plans, the Lykes hired his apprentice, John Rattenbury, to complete the plans according to the details set forth by Wright. The couple loved the completed plans, though it was another seven years before they started construction. When they did, Rattenbury oversaw the build and the home was completed in 1967. In addition to the structure itself, Wright also designed the furniture and built-ins for the home. Now for sale and registered with the Frank Lloyd Wright Building Conservancy, the 2,849-square-foot home on one acre of desert plateau has three bedrooms, three bathrooms, the Wright-signature large living room fireplace intended to bring families and friends together, a lower-level media room, two home offices with built-ins of desk, cabinet storage and walls of shelving, a distinctive curved kitchen with Wright-designed island and unique under-cabinet windows and timeless stainless-steel counters, contemporary tiled large baths, and a privacy walled crescent pool patio viewed from inside through glass walls. There is also a separate large office in the round with all built-in furnishings encircled by half-moon windows. Views of valley and mountains can be seen from almost every room. Prince loved the color purple and incorporated it into several of his homes. In 2004, great publicity ensued when he painted a Beverly Hills home he had rented from NBA Basketball star Carlos Boozer in purple stripes, installed a purple carpet with his monogram and changed the plumbing to send water to a hair salon. Boozer filed a lawsuit saying he had broken the terms of his lease, but later withdrew it when Prince paid to have the house returned to its former neutrals. Named as one “of the most influential artists of the rock & roll era," Prince was inducted into the Rock and Roll Hall of Fame in 2004, won an Academy Award for his film “Purple Rain” along with seven Grammy Awards and a Golden Globe Award. Prince has sold over 100 million records, making him one of the highest paid artists of all time. Though connected with many celebrity women, he married his backup singer, Mayte Garcia, on Valentine’s Day 1996. In 1998, Prince bought a stunning villa in Spain as a gift to his wife. It was west of Marbella in the hills of El Paraiso with views of the sea, mountains, valley and golf course. They decorated it elaborately in pure Prince style. Mayte and Prince divorced in 1999 and sold the villa. The new owner redecorated to tone it down to more universally preferred elegance, and put it on the market in early 2016. Sited on 1.45 subtropical walled and landscaped acres, the 7,535-square-foot villa has 2,583 square feet of terraces for outdoor living with tennis court, pool and three-car garage with additional parking for six. The landscape is softly lit at night affording ambiance for outdoor entertaining. Inside are six bedroom suites including two masters with the grand master encompassing two levels. Public rooms are opulent with good flow, a new fully-equipped kitchen has been reconstructed and the entire villa has been updated with the finest materials. It is said that this home and its romantic location was the inspiration for many of Prince’s songs. Evert Ebus of Engel & Volkers is the listing agent for the villa, previously priced at $5.99 million, now reduced to $5.2 million. Back in 1982 when he was still a Democrat, before he was a billionaire and a brand name and reality television star and on his first marriage to Ivana, Donald Trump was a rising star in the New York City real estate world and shopping for his first trophy mansion. Trump’s fabulous homes, that began with that first mansion in Connecticut, is a big part of the man’s story. Trump’s collection of expensive, and even a few historic homes, rivals almost anyone else in the world. His main residence is a posh three-level penthouse at Trump Tower on New York's Fifth Avenue where he has lived and supervised his vast business operations since 1983. Also in the Gotham area, in 1996 he purchased a 60-room mansion in Bedford, New York with three pools and a bowling alley. He later bought Albemarle with a 23,000-square-foot home, vineyard and winery on 2,000 acres in Virginia for $12.7 million, a fraction of the original asking price of $100 million. It is now a B&B known as Albemarle Estate at Trump Winery with daily room rates ranging from about $400. In 2008, Trump expanded his home stockpile to the West Coast when he purchased a six bedroom, 10,400-square-foot home on Rodeo Drive in Beverly Hills. His #1 trophy home is still his Mar-A-Lago mansion and resort for the ultra wealthy in Palm Beach, Florida that he purchased in 1985 for $10 million. The 1920's mansion with 62,000 square feet and over 100 rooms was originally built for Post Cereal heiress, Marjorie Merriweather Post. Donald Trump was only 35 when he and Ivana purchased his starter mansion, a 5.8-acre home on a peninsula in Greenwich for $4 million. Always a family-oriented business, Ivana was also remodeling the Plaza Hotel in Manhattan which Trump purchased in the early 1980s and she was able to incorporate many of the same materials in the decoration of their new home creating a residence dripping in gold leaf, elegant chandeliers and crown moldings. When they divorced in 1992, Ivana won the mansion in the property settlement. She sold the home in 1998 for $15 million and the mansion's new owners immediately began a renovation to tone it down a bit and also added tennis courts, indoor lap pool, sauna and a 4,000-square-foot addition with guest suites. Originally built in 1939 for Robert Hillas, president of the Superheater Company in New York City, the 19,773-square-foot Georgian Colonial main house and guest house have eight bedrooms, thirteen baths, a three-story rotunda foyer with double grand staircase, formal rooms and views of Long Island Sound. Also included is a home theater, putting green, multiple terraces and patios, tennis courts and three fully-equipped staff apartments. Donald Trump’s former Connecticut mansion with major additions, six waterfront acres and a private boat dock was for sale at $45 million. It has recently been taken off the market; it's unclear whether it's been sold or simply on pause. Pharrell Williams had every reason to be “Happy” after finally selling his Miami Brickell Avenue penthouse to a New Jersey businessman. With his main residence in Los Angeles’ swanky Laurel Canyon that he bought in 2015, it wasn’t feasible to hold on to the penthouse, even if it did have what many would call the best location in the South Florida condo lineup. Perched on top of the 40-story Bristol Tower at the entrance to Key Biscayne, it is just a stone’s throw from trendy Coconut Grove and a quick drive in the other direction to South Beach - three locations with possibly the best restaurants, clubs, beaches and marinas in Miami. At 10,000 square feet, the penthouse has five bedrooms, seven bathrooms and an additional 5,000 square feet of terraces with its own rooftop swimming pool and a second-level summer kitchen. He purchased the condo in 2007 for $12.525 million, then transformed it into a mogul palace with his art and furniture collection. Views of 360 degrees take in Biscayne Bay, the Atlantic Ocean, Key Biscayne, Coconut Grove and the Miami condos skyline. Originally listed in 2012 for $16.8 million, the property went on and off the market with several price cuts until selling for $9.25 million. It was a good year for Tyler Perry whose newest movie, “Boo,” grossed $75 million at the box office. He also sold his Georgia mansion, listed in 2015 at $25 million, for $17.5 million - breaking the record for Atlanta area real estate sales. Perched high above the Chattahoochee River, the 34,688-square-foot home has seven bedrooms and fourteen baths, stately formal rooms, a two-story library, infinity-edge swimming pool, lighted tennis court on top of a two-story parking garage, fully-equipped gym, spa, theater, hobby house and an underground ballroom with catering kitchen. There are both formal and informal gardens, an entire estate generator, guard house, caretaker’s suite and presidential-level security system including two gated and secured residential entrances. As Kirk Douglas celebrated his 100th birthday at the Beverly Hills Hotel on December 9th, he was joined by his wife, his son Michael and wife Catherine Zeta-Jones, Don Rickles, important film executive friends and his cardiologist who handed him a tall vodka. Since the doctor told him for years that he couldn’t have a drink until he turned 100, it was a fitting thing to do. To Kirk Douglas, age is still just a matter of numbers, but it’s still nice to have accumulated more memories than almost anyone else. His Palm Springs home likely held many of the happiest. The longtime vacation home of Kirk and Anne Douglas in the historic Old Las Palmas neighborhood, where they escaped Hollywood for over 40 years until they sold it in 1999, was for sale in 2016. The 4,000-square-foot home, originally designed by Donald Wexler for the owner of the champion racehorse Seabiscuit, retains the purity of Wexler’s original design with its flagstone-and-pecky cypress foyer, walls of floor-to-ceiling glass and beamed ceilings. The open floor plan includes formal dining and sitting areas with casual fireside seating; the original mirrored wet bar reminding of old Hollywood, updated baths and an updated kitchen with the expected granite and stainless steel. The five bedrooms and eight baths include two master suites, Kirk’s suite and Anne’s suite designed each to their personal preferences, both opening to terraces overlooking the mature landscaped grounds. A large interior atrium opens the main rooms to outdoor living and the exterior gated perimeter wall encloses gardens, pool terrace and tennis court. The new owner will be the next door neighbor of Leonardo DiCaprio, who purchased Dinah Shore’s former home in 2014. The Douglas home sold above the asking price of $3.45 million. The buyers are a perfect match as they have a longtime personal friendship with Michael Douglas and his wife. Accordingly, Kirk and Anne, their children and grandchildren will once again be enjoying the secluded estate. Jim Schwietz of Bennion Deville Homes in Palm Springs was the listing agent. Visit TopTenRealEstateDeals.com for more celebrity, famous and spectacular homes.